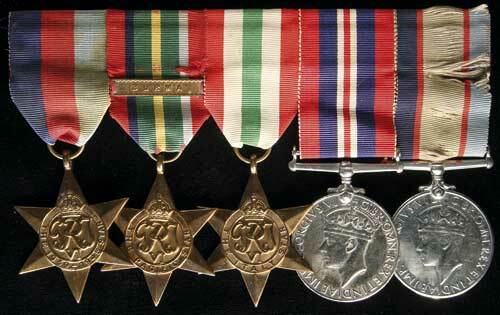 GROUP OF FIVE: 1939-45 Star; Pacific Star, - clasp - Burma; Italy Star; War Medal 1939-45; Australia Service Medal 1939-45. W.J.Clough M.N. on first and last medal, W.J.Clough M.N. Seaman on all other medals. All medals impressed. Swing mounted, ribbons dirty or damaged, medals nearly extremely fine. William James Clough, born 1920 at Sydney, NSW; Engaged with Merchant Navy 18Jun1939 at Sydney, NSW; Last engagement 23Oct1945 as 1 Gd Stwd ex Wanganella.